The difficulty of posting photos of my stuff is beginning to perplex me. I keep saying (to myself still, thank God) why doesn't this look like the beads? The answers to this are as complex as why the glass does what it does. Add to this very little skill in actual photography or composition and I am frustrated as heck. Colors look different against each other. Dragonjools posted about this with a link to a site with magenta, orange and turquoise. Colors look different with different light sources. Witness the flower necklace pictures. Colors look different with different cameras and monitors. Where is the bead in this? 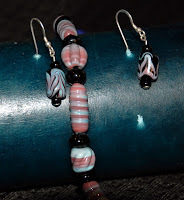 Above is a some fairly pretty beads using a base of 220 periwinkle and my miserable rose cane on the left and 256 dark pink opaque on the right. We shot these on about 20 different backgrounds and this is the only one that showed what the colors even looked like. I remember during school pictures the photographers sent home instructions on what colors to avoid when sending the kids to school on picture day. Now I know why. 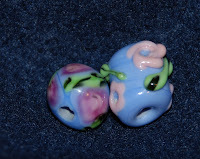 Surprisingly, the beads on the right, which I am calling pebble beads, look best on a sand colored background. My friend Carol, who was taking the pictures, wished we had some sand to take the pictures on because they reminded her of pebbles too. I suggested the cat box but that was turned down for obvious reasons. We settled on the underside of a lid from her crock collection. Two of these are ivory with silver melted in and the middle one is CiM stoneground with silver melted in and ivory dots topped with EDP. I don't know whether I liked the way the ivory turned all black or not because all the spots did the same thing. The EDP looks nice, though. 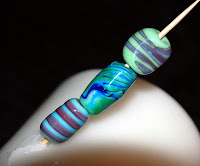 I have another hundred photos of these beads against various backgrounds. 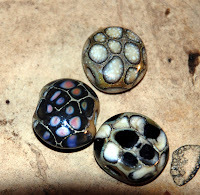 The top bead is Effetre 213 grasshopper and copper red green stringer, the middle one is copper green with a complex stringer of turquoise, cobalt and grass green opaque, and the bottom one is copper green with a copper green red stringer. These changed color the least, but were the most difficult to photograph at the time. Copper green red. Beautiful if badly named color. It probably is copper green changed in some way to produce the reddish tones, but the copper green turns turquoise and the red turns magenta. The necklace beads are self copper green red and black spacers and the earrings are vetro black feathered with copper green red stringer. The amount of color adjusting this photo took was stupefying. Usually I just white adjust and save. On this one I had to white adjust, normalize, hue and saturation adjust, color balance in all three levels, then white adjust and normalize again. To get it to look like what the bead looked like in the first place. The beads on the white candle were just white balanced. Go fig.